You can add a rubric to a graded discussion to help students understand expectations for the discussion and how you intend to score their replies. Occasionally, rubrics are added to assignments when you have an outcome inside of the rubric that you would like to use for alignment purposes. 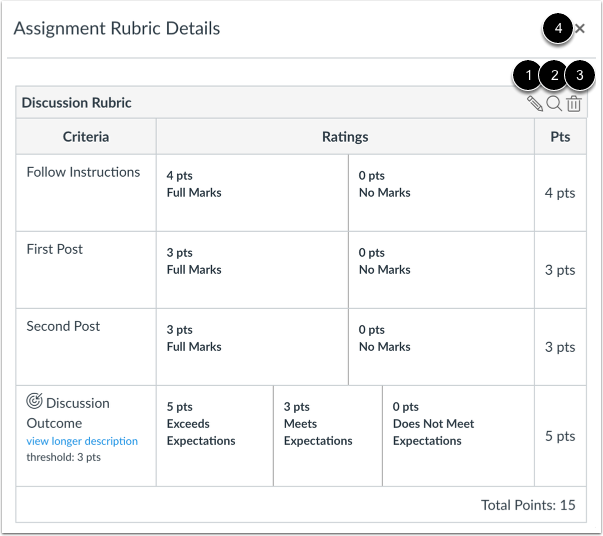 In addition to graded discussions, rubrics can also be added to assignments and quizzes. 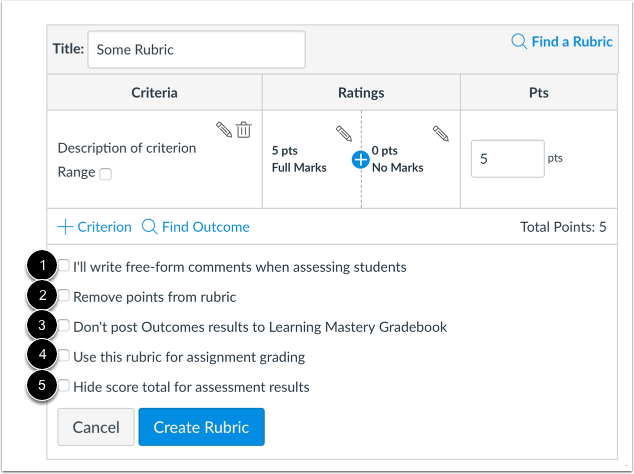 Rubrics can be added by finding an existing rubric in one of your courses, or by creating a new rubric. Click the Options icon  and select the Add Rubric option . To find an existing rubric, click the Find a Rubric link. You can find rubrics that were created in previous graded discussions as well as rubrics created in other courses where you have an instructor role. In the first column, select a course or account . In the second column, locate and click the name of a rubric . You can view the criteria and points in each rubric. To select a rubric for the graded discussion, scroll to the bottom of the rubric and click the Use This Rubric button . To reopen the rubric and select rubric settings, click the Edit icon. If you can't find an existing rubric to use for the graded discussion, you can create a new rubric for your graded discussion. New rubrics are saved in your course for future use. 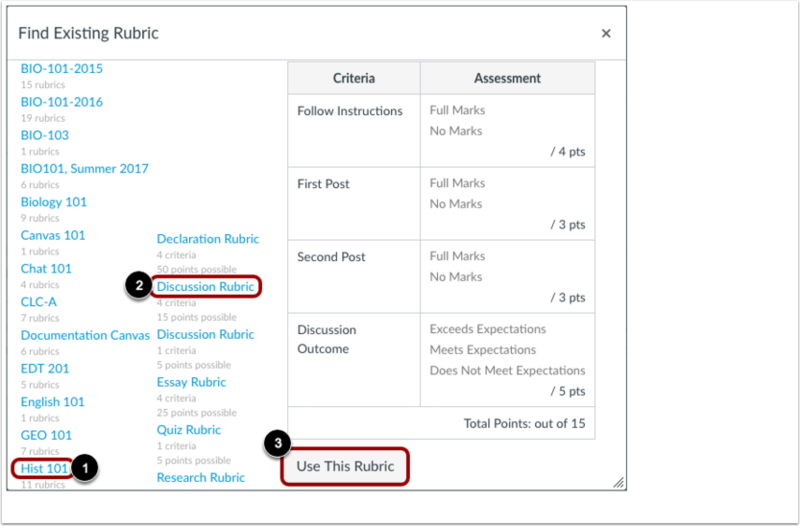 Once you have added a rubric, you can select several options for the rubric. If you want to write free-form comments to students in SpeedGrader, select the I'll write free-form comments... checkbox . If this option is selected, no ratings are used to assess the student and criterion values are assigned manually. If you want to remove points from the rubric, select the Remove points from rubric checkbox . 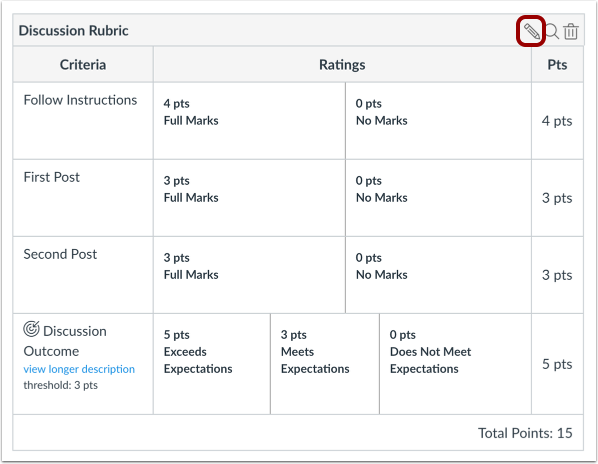 If this option is selected, no points are associated with the rubric, but students can still be rated using the rubric criterion. If you have the Learning Mastery Gradebook enabled but you don't want outcome results to be posted to the Learning Mastery Gradebook, select the Don't post Outcomes results to Learning Mastery Gradebook checkbox . If this option is selected, students will be able to see rubric and outcome results in the Grades and submission details pages but results will not be posted to the Learning Mastery Gradebook. If you want to use the rubric for grading in SpeedGrader, select the Use this rubric for assignment grading checkbox . If you don't want students to see the score total for the rubric, select the Hide score total for assessment results checkbox . Students can still see the point values for each criterion, but the total score will not be shown at the bottom of the rubric. This option is only available if the rubric is not used for grading and only applies to students when they view rubrics from the Grades page. Click the Update Rubric button. Note: If you created a new rubric, the assignment will show the Create Rubric button. 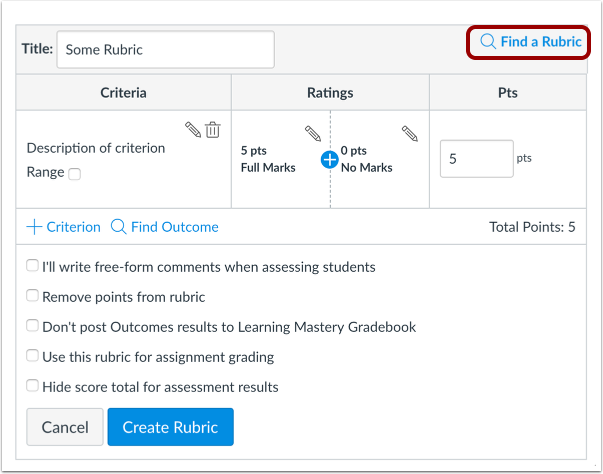 If you select the option to use the rubric for grading, Canvas will compare the rubric score and Assignment points. 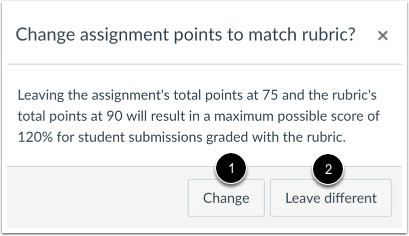 If the number of points in the rubric is different than the number of points in the Assignment, Canvas will generate a warning message notifying that the point values are not equal. To update the number of points in the assignment, click the Change button . Otherwise, click the Leave different button . View the rubric for the graded discussion. To edit the rubric, click the Edit icon . To replace the rubric with an existing rubric, click the Search icon . To delete the rubric from the graded discussion, click the Delete icon . 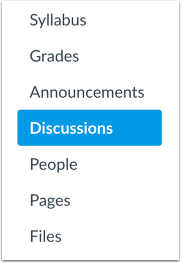 To close the rubric and return to the graded discussion, click the Close icon . If you try to edit a rubric that has been used in more than one assignment (assignment, graded discussion, or quiz), Canvas generates a warning message that the rubric can't be edited. This message means that the rubric can't be edited directly, but you can create a copy of the rubric. To create a copy of the rubric, click the OK button. 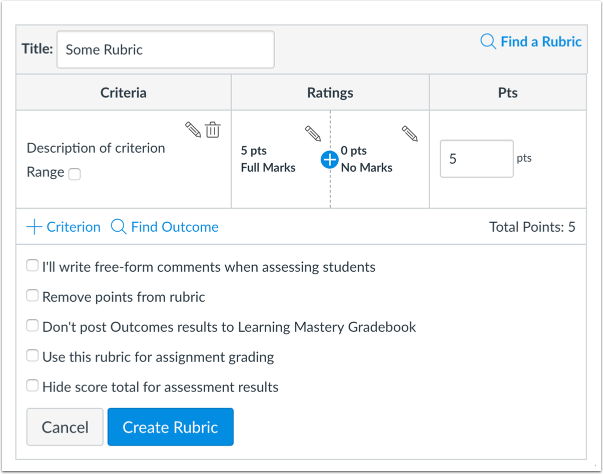 Canvas will create a copied version of the rubric. The edited version will automatically replace the previous rubric in the graded discussion. If you use the rubric for grading, the rubric will update for all students in SpeedGrader. You may want to re-review student discussion replies that may have already been graded with the original rubric. The copied rubric will also be saved in the course rubrics list for future use. Previous Topic:How do I add a rubric to an assignment? Next Topic:How do I add a rubric to a quiz? Table of Contents > Rubrics > How do I add a rubric to a graded discussion? Re: How to add grade points to a discussion? Re: Attaching a teacher created rubric to a discussion.